I am a president of a sovereign state and we have long ceased to be a colony. I do not have any master except the Filipino people, nobody but nobody. You must be respectful. Do not just throw questions. Son of a whore I will swear at you in that forum. In hopes of making some form of amends, Duterte apologized, and suggested the expletive wasn't a "personal attack," according to a statement read by his spokesman. While claiming an insult as pointed as "son of a whore" isn't personal might sound absurd coming from most world leaders, a report from The Telegraph noted that Duterte once said "F*ck you" to the United Nations. Initially, in response to Duterte's comments, Obama said, "Clearly, he’s a colorful guy." He also said, “What I’ve instructed my team to do is to talk to their Philippine counterparts to find out, is if this in fact a time where we can have some constructive, productive conversations." Hours later, the scheduled meeting between Obama and Duterte was canceled. The White House has "tried to play down the public spat" and said Obama would likely "speak with Mr. Duterte informally" during the Association of Southeast Asian Nations summit (which brought the two men to Laos), according to The Wall Street Journal. 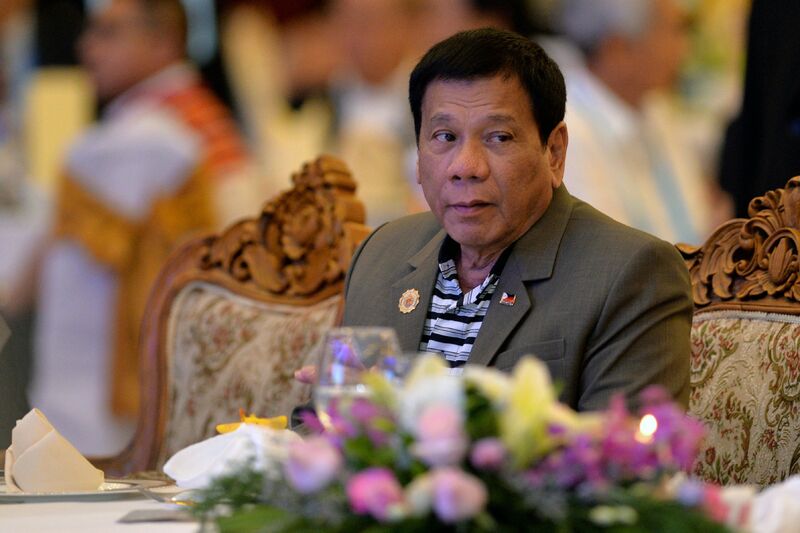 Duterte has a pattern of employing an arsenal of explicit insults. He's arguably one of the brashest and boorish leaders to grace the world stage in 2016 — he may even remind Americans of a certain man who is one election away from the presidency (*cough* Donald Trump *cough*). Granted, comparing Trump to Duterte may not be giving the Donald a fair shake. Even though Trump insinuated that his Republican presidential opponent, Ted Cruz, was "a p*ssy" on the campaign trail, and has made jabs at Hillary Clinton's "physical stamina" and mental state, Duterte may outdo him. Let's recall some of the infamous insults Duterte has hurled just in the past few months. Duterte called Pope Francis a "son of a whore" after his visit to the Philippines caused traffic jams in May. Just last month, Duterte referred to U.S. Ambassador to the Philippines Philip Goldberg as Secretary of State John Kerry's "gay ambassador, the son of a whore." Hopefully, for the sake of the world, Trump and Duterte will never be given the chance to bond over their love of juvenile insults and oppressive policies.